A Mickey body being lifted 20 feet in the air on a “scissor lift” manufactured by Tesco Equipment LLC, a leading supplier of aviation and industrial lift systems. Airports use the lifts and bodies to stock airplanes for in-flight food service. You might say Mickey Truck Bodies is “getting a rise” from its newest business partner – Tesco Equipment LLC, a leading supplier of aviation and industrial lift systems around the world. 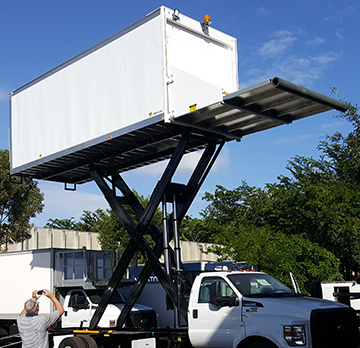 The Coral Springs, FL-based company’s scissor lifts are used in a variety aircraft, ranging from regional jets to the Airbus A380, to support catering, cabin service, ambulatory and other applications.